The trellis has withstood the winds, but these little guys didn’t. At least I learned my lesson to not leave transplants out in the open just yet. Thanks for taking one for the team, guys. May you rest in peas. 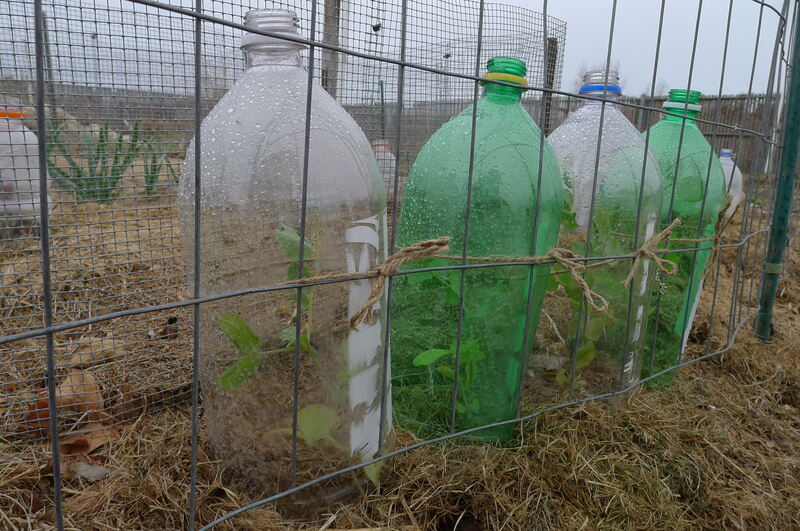 On the contrary, the plants sheltered by the gatorade bottle cloches are surviving. These were made simply by cutting out the bottoms of 1 L gatorade bottles that I scavenged from the recycling bins. They also serve as humidity domes and as protection from slugs and such. I pressed them into the ground a bit so they wouldn’t just blow away or get knocked over by the slightest breeze. 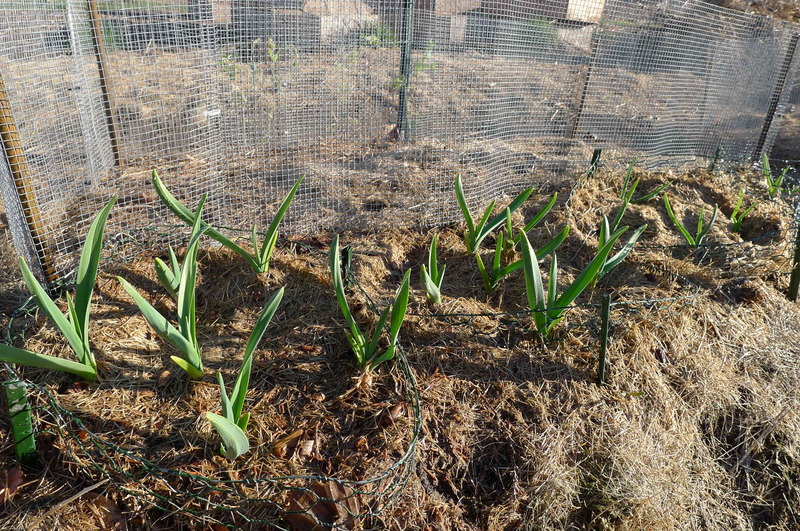 The onions transplanted fine and it seems like they’ll make it through (fingers crossed). 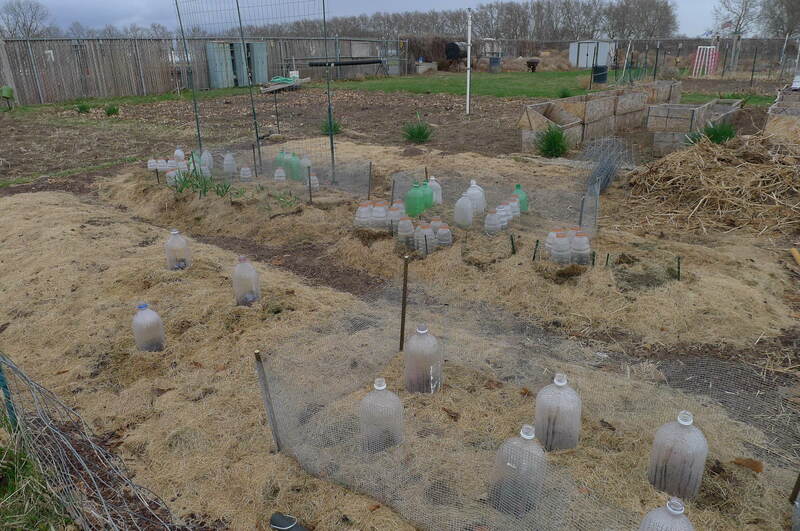 Seeds of other roots crops, such as carrots, radishes, and beets, were sown outdoors under these cloches. 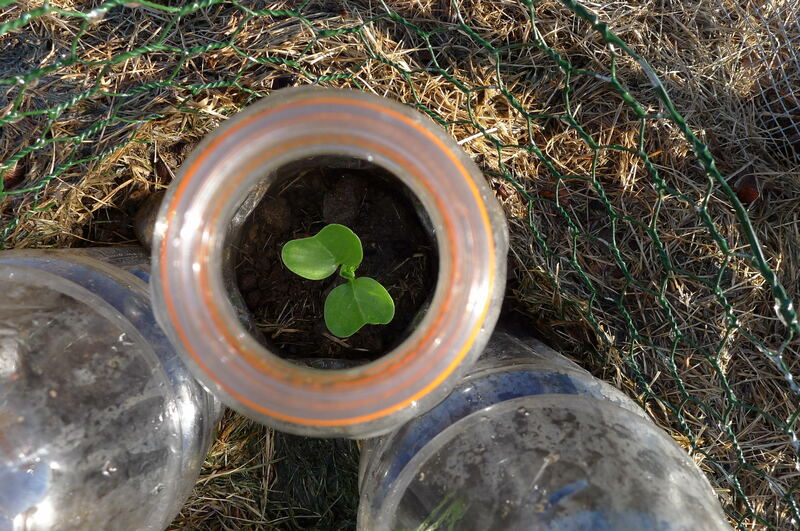 Their sprouts have provided hope for more life in the garden at this time. Such a sight equals happiness! 1. I am not alone in this failed endeavor. 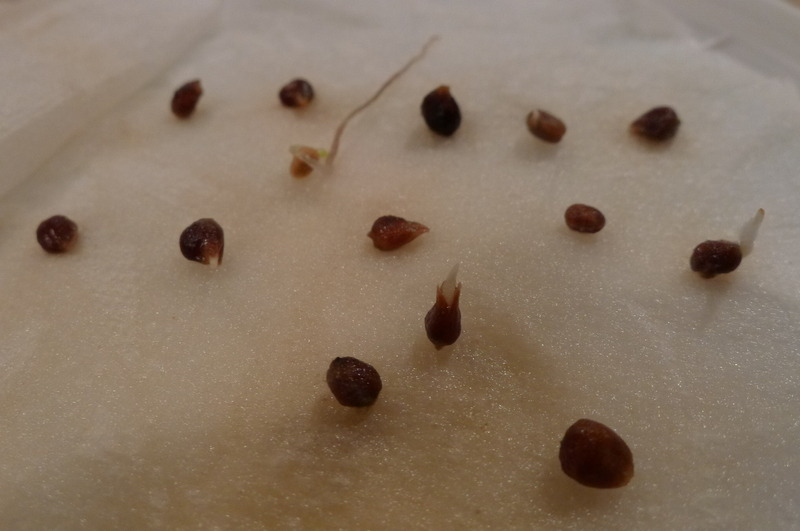 Spinach seeds don’t have particularly good germination rates, so I shouldn’t take it personally. 2. 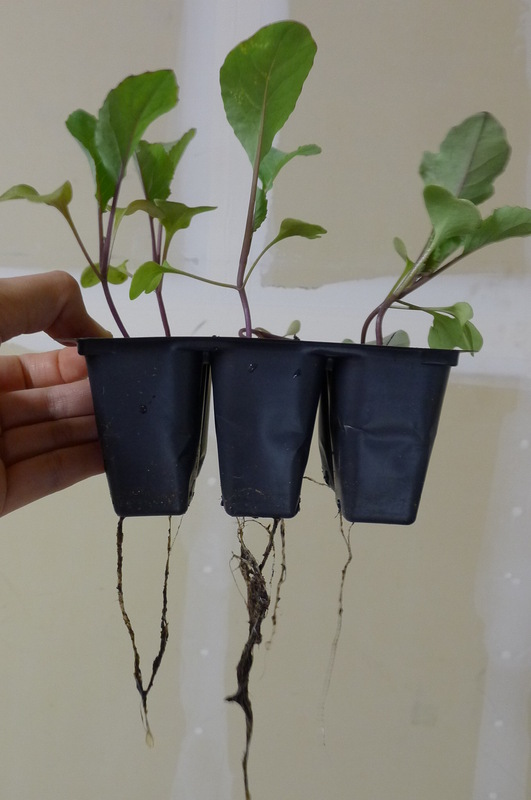 Spinach seeds are no longer viable after 2 years. 3. 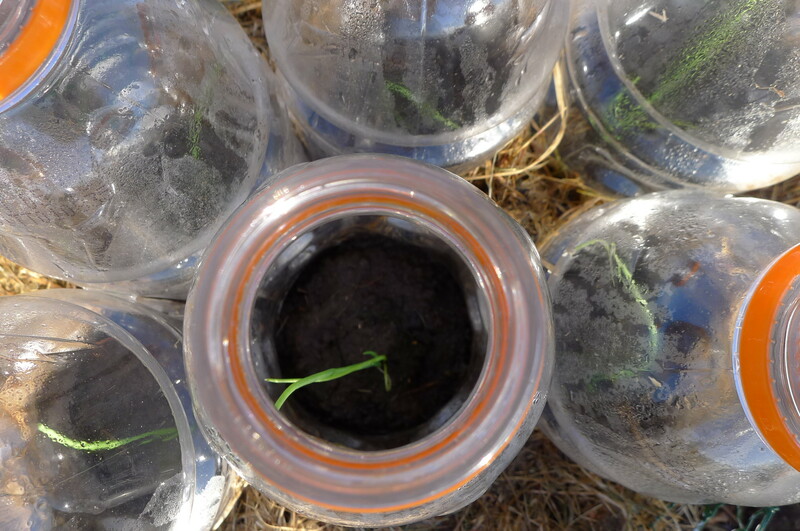 They germinate in cool temperature. 4. Start them in moist paper towels. This advice was taken from a GardenWeb Forum: fold a moist paper towel over some spinach seeds, store it in a small sealed container, keep it in the refrigerator for a day, then let it sit at room temperature. So whaddya know, it really worked! 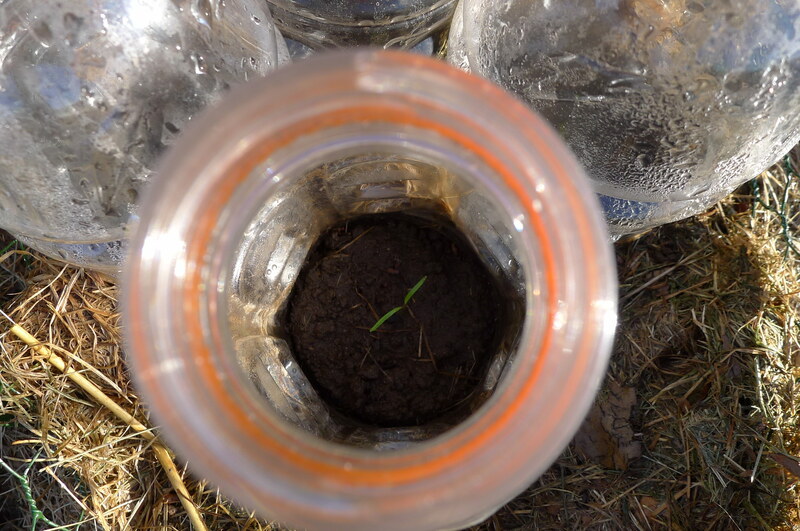 I’ve incorporated no-till gardening practices into my routine to alleviate the cleaning duties. At the end of last year’s growing season (5 months ago), I collected cardboard from work and used it as an organic weed mat on my garden plot. For something that was free, it did an excellent job. Most of last year’s weeds and plants had decomposed underneath the cardboard sheets, so all I had to do was pull out roots here and there. 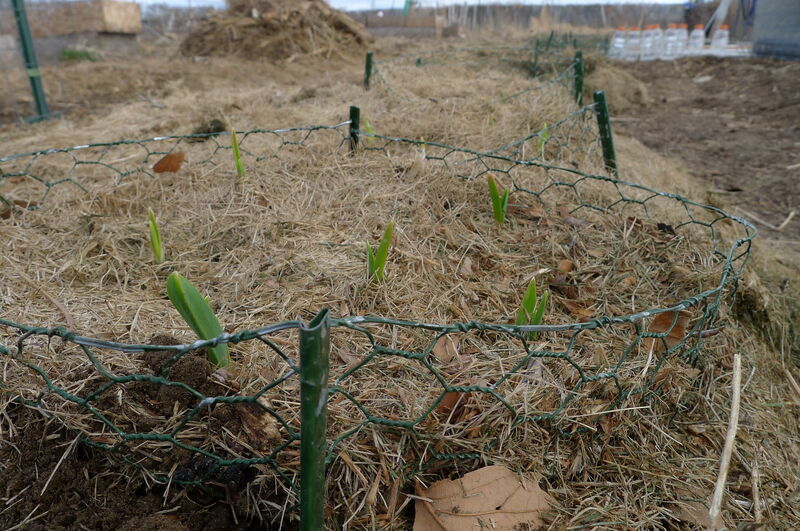 This method also gave the added bonus of providing compost for the soil. This is the organic fertilizer formula that a friend taught me to use years ago in San Diego. It has continued to serve my gardens well since then. In my humble opinion, grass clippings are the preferred vegetable garden mulch. 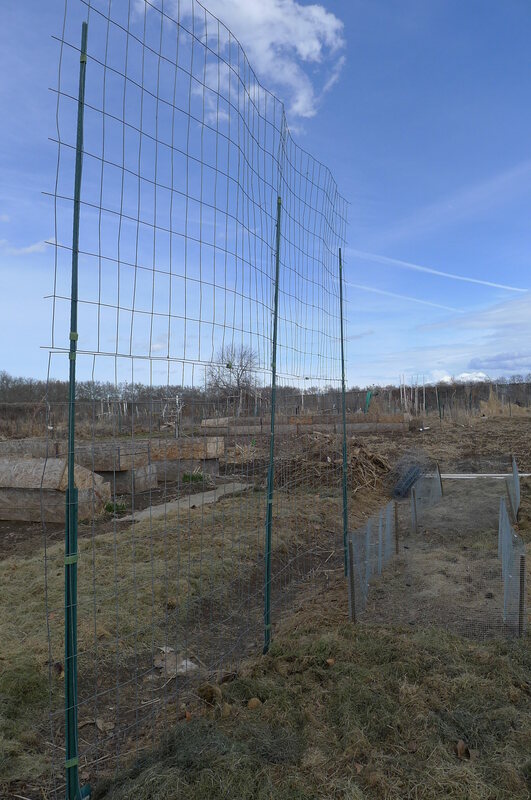 It stays put despite strong winds (unlike leaves), it provides nitrogen to the soil, and in my current situation, it’s available in large mounds for free next to the community garden. Before I discovered this boon, I made the mistake last year of applying bark mulch. I was afterwards informed to avoid using bark mulch in the vegetable garden because it would leach acid into the soil. Thankfully, I was able to rake the bark mulch off before I planted anything. This page on vegetable garden maintenance provides a good breakdown of the different types of garden mulch. The stakes were reinforced with 3 ft U-posts, which will hopefully withstand the occasional 20-30 mph winds here. Welded wire was secured to the stakes/posts with velcro tape. I don’t believe in pesticides. I also don’t care for traps, which would force me to deal with pest carcasses. 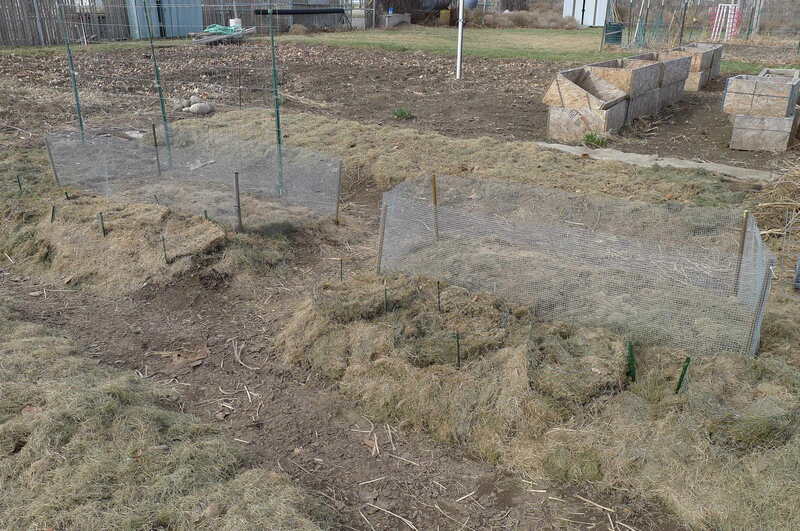 Mice, rabbits, and gophers do roam freely within the community garden, unfortunately. 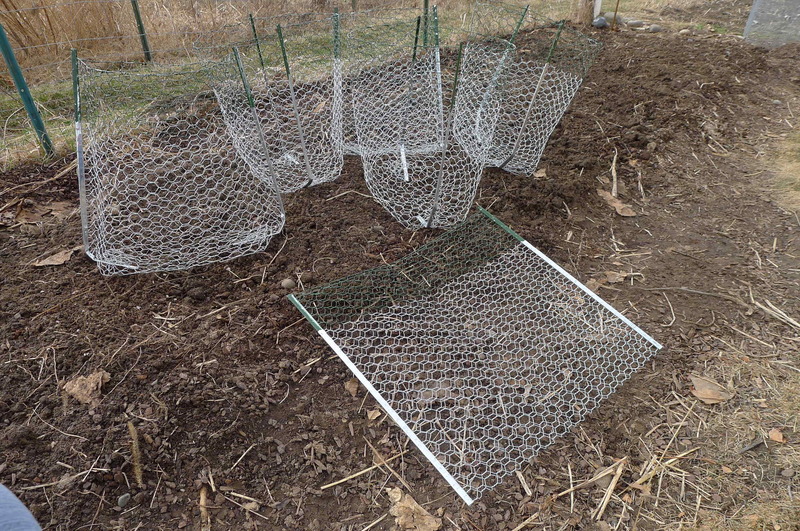 The prevention methods I’m trying this season are gopher baskets for root crops and boxes for leafy vegetables. 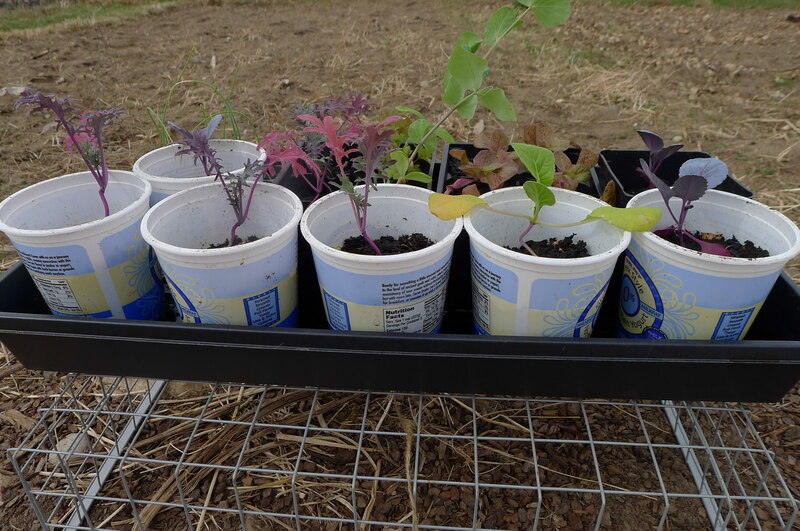 I purchased 10 of these 5 gallon gopher baskets from Peaceful Valley ($4 each). These require some shaping and it’s tedious work to have to dig them into the ground, but I’ll do almost anything to protect my precious plants. 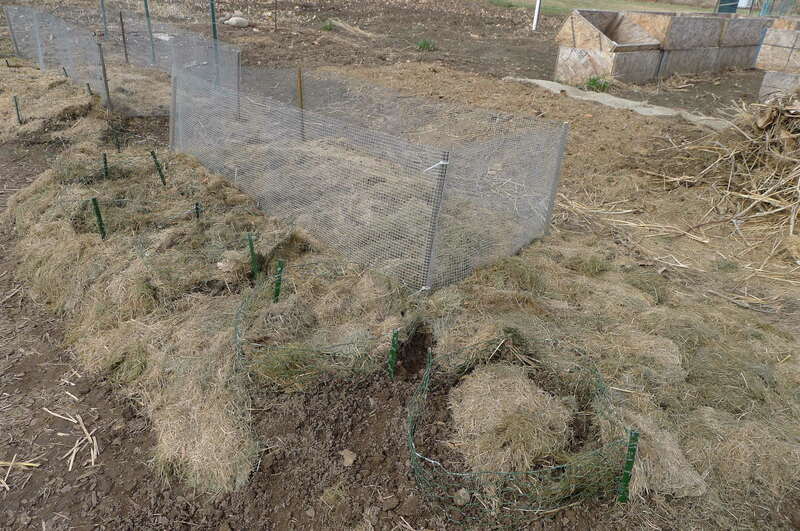 I constructed a few boxes (2′ x 4′ x 1′) from 1/4″ mesh hardware cloth to guard against mice and rabbits. The boxes are held in place at each corner with 2 ft rebar stakes. And now the garden is ready, bring it on! A calm, sunny day in the 60’s is like a diamond in the rough weather of the Tri-Cities. So when a place like this gives you a day like that, you make the most of it…because you never know when you’ll get that day again. 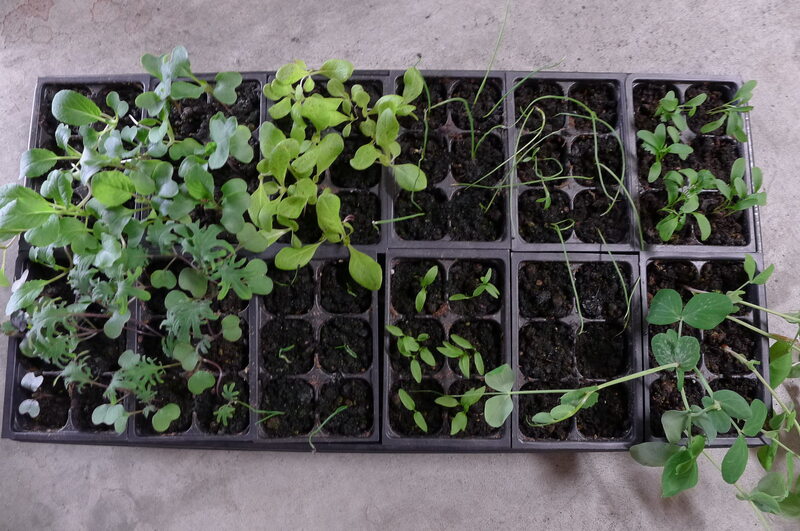 Today was a such a day, which made it perfect to start hardening off the seedlings. 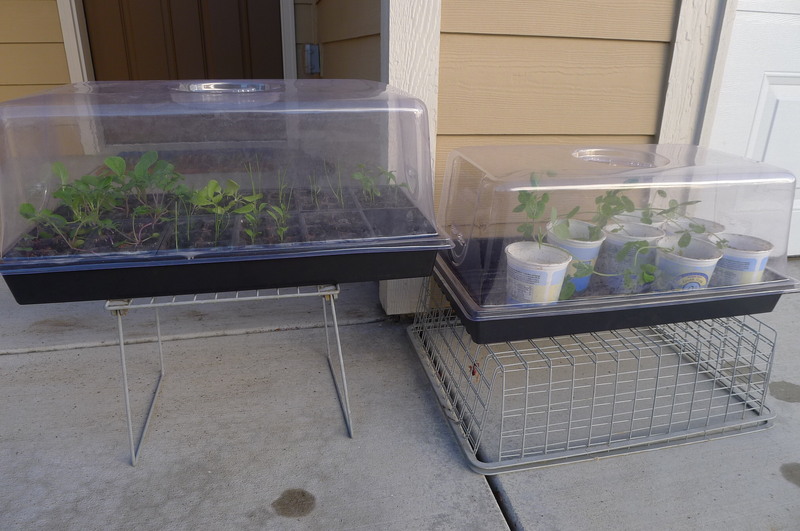 The seed trays were covered with humidity domes and left outside this morning for a few hours to bask in the sunshine. 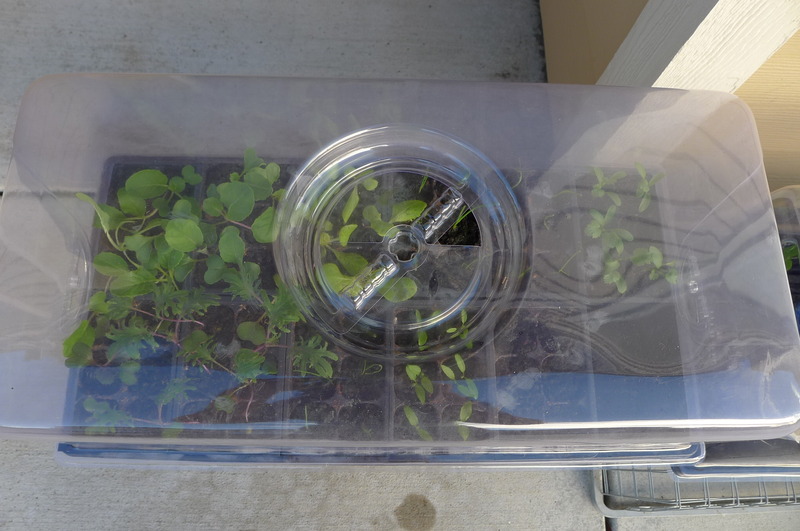 And now, a shameless plug about these humidity domes: these can make the transition from indoors to outdoors for seedlings easier by serving as mini greenhouses. 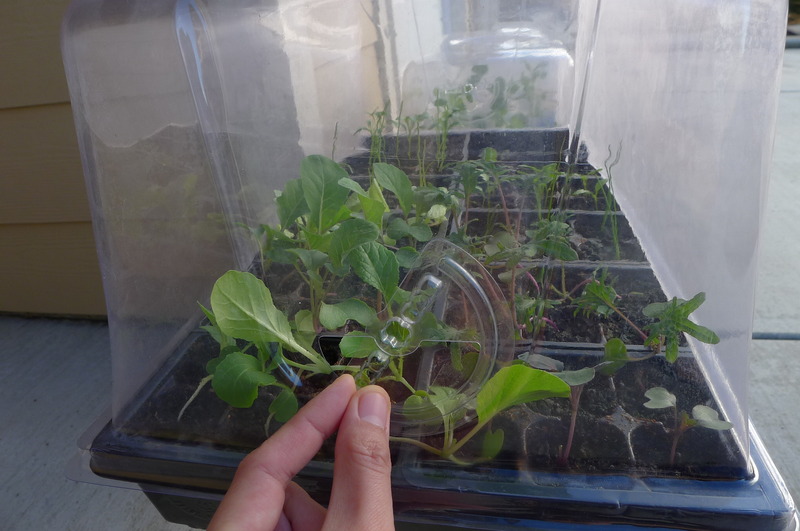 They’re 7″ tall to accommodate bigger plant starts, with adjustable vents on the top and sides. Plus, I found these for a good price ($5 each) at Portland Nursery. 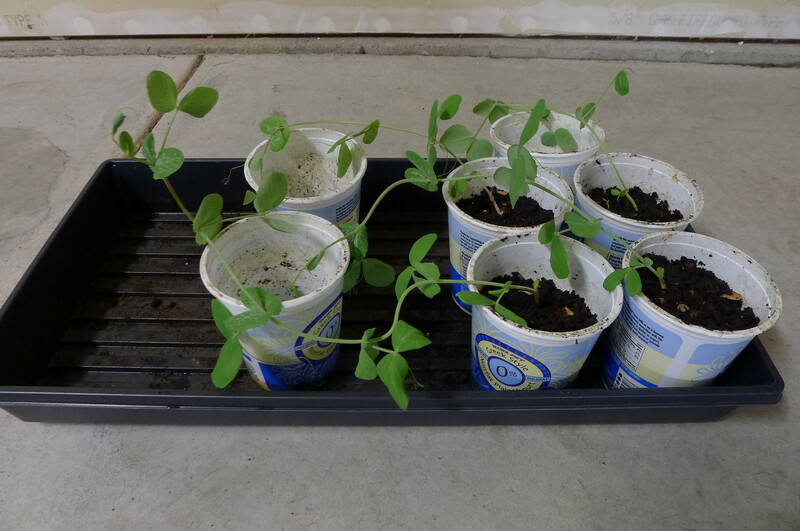 When I checked on the seedlings at noon, I noticed that some were wilting from the heat. It must have been a bit much for their first day out, so I re-watered them and returned them indoors under the grow lights for the remainder of the day. They eventually perked back up. 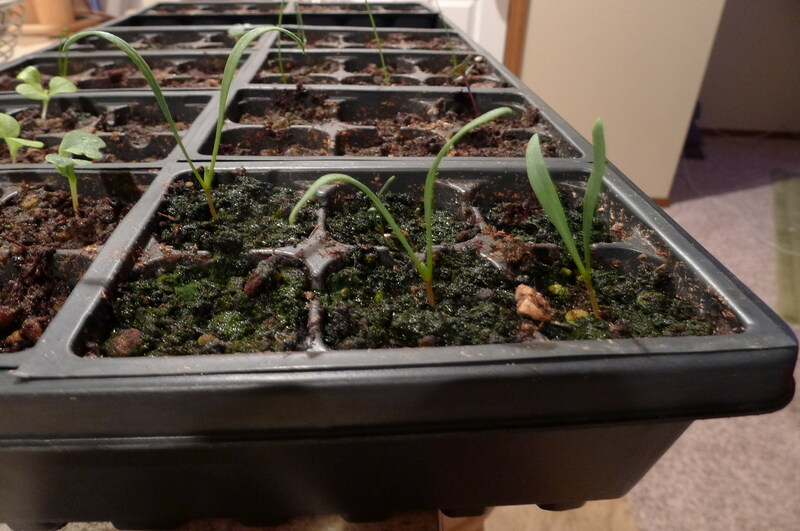 I’ll have to harden off the seedlings more gradually so I don’t end up killing them prematurely. Lastly, I started a new batch of seeds to practice succession planting. My spring garden plan allotted space for more bok choy, lettuce, onions, and peas. 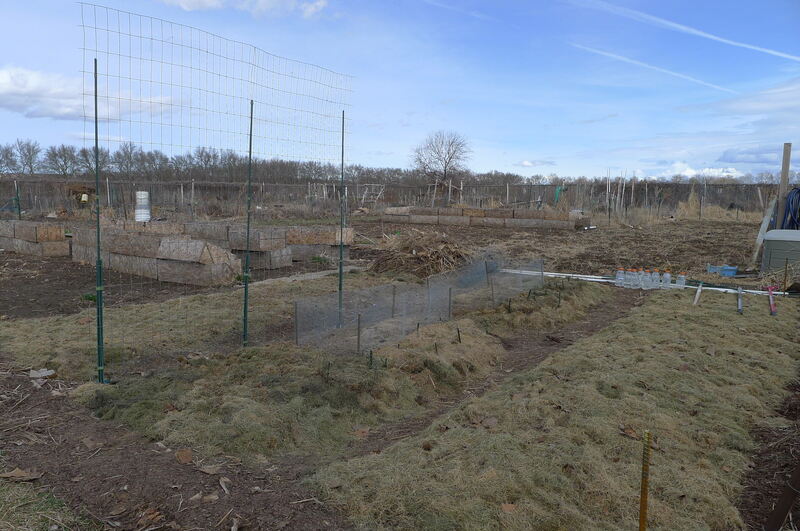 Staggering the plantings will also provide a more continuous harvest instead of one large lump sum of produce. Let’s see what happens. The seedlings are about 3 weeks old now and have flourished under the grow lights. 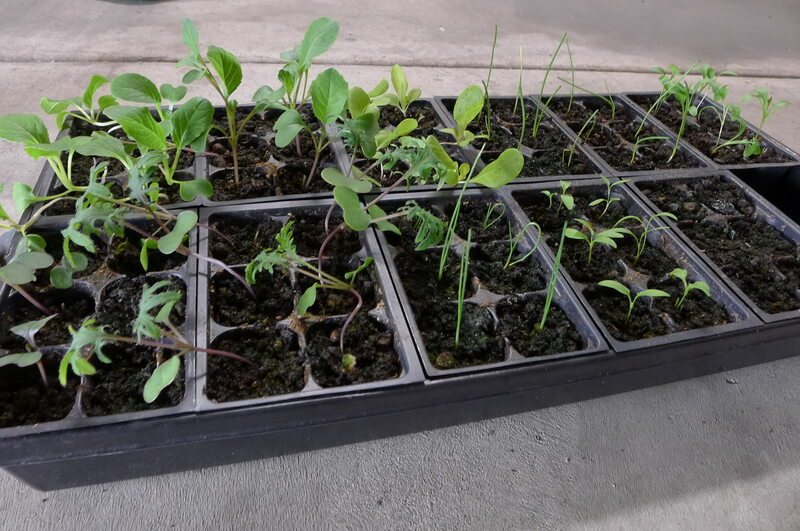 Since I sowed a couple seeds per cell, I thinned out the plants by cutting out the weaker seedlings, leaving the strongest one in each cell. Oh, the tough decisions a parent must make. 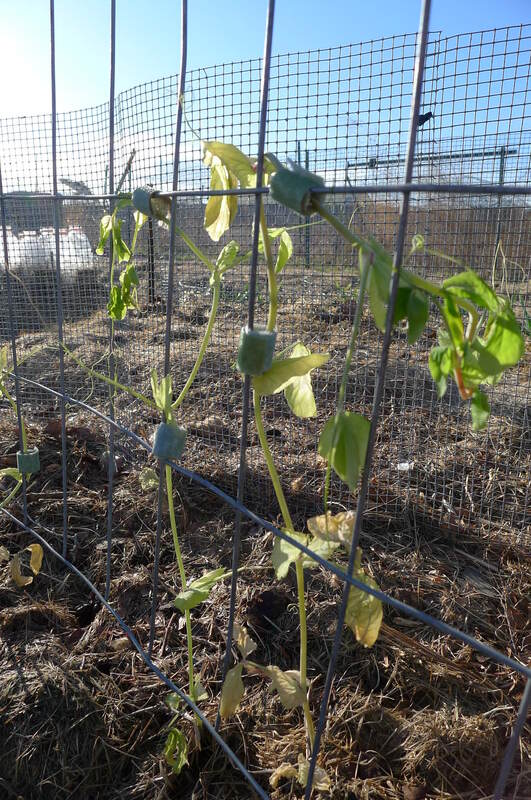 The peas were the exception with just one pea seed in each cell. 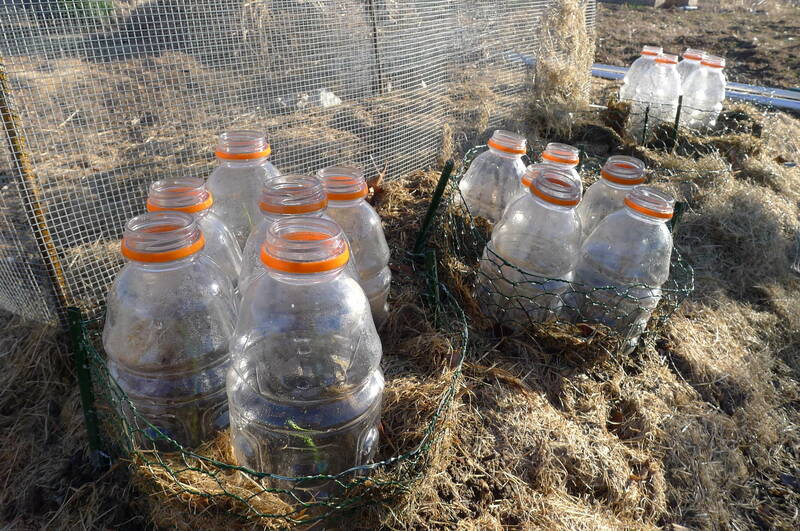 They grew big relatively fast, so I transferred them to larger containers (reused yogurt cups with drainage holes cut out at the bottom, filled with vermicompost for fertilizer). They are in dire need of trellising, but the weekend weather hasn’t been conducive to garden work thus far.